The Wireless electricity transmission system pioneered by Nikola Tesla has the potential to meet our future global energy needs, if only the funding and organizational structures can be put in place as a matter of urgency. Nikola Tesla, the father of AC electricity, is responsible for recognising that an atmospheric and a terrestrial storage battery already exists everywhere on Earth, for the benefit of mankind. A century later, only a few visionary scientists recognise the untapped renewable reservoir of terawatts of electrical power (3,000 gigawatts) that sits dormant above us, waiting to be utilised. Tesla tried and tried for years until, in 1917, the US government blew up the abandoned Wardenclyffe Tower because suspected German spies were seen ‘lurking’ around it. With Edison as his willing ally, Morgan even publicly discredited Tesla’s name, so that all of the five school textbook publishers of the time removed any reference to him. Is it any wonder why, even today – more than 100 years later – hardly anyone knows who Tesla is? The rest of this article will present a physics and electrical engineering argument for a subsequently forgotten engineering alternative for energy generation and transmission. This verified the tremendous efficiency of his peculiar method of pumping current into a spherical ball to charge it up, before discharging it as a pulse of electrical energy: a ‘longitudinal’ acoustic type of compression wave, rather than an electromagnetic Hertzian type of transverse wave. It was therefore more akin to electrostatic discharge than wave mechanics. 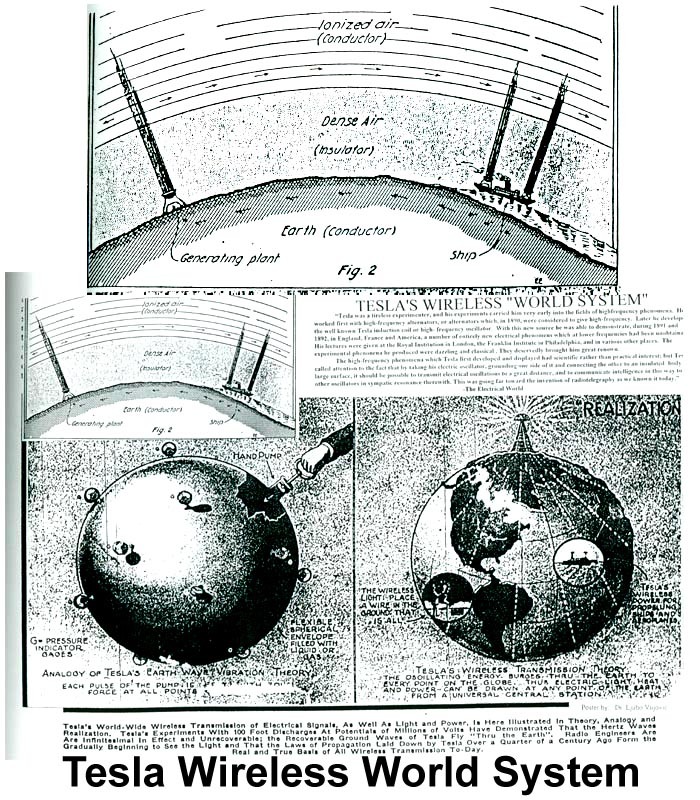 Tesla also planned to include a stationary resonant wave creation globally, within the Earth-ionosphere cavity, as part of the wireless transmission of power. Examining the pair of 1900 patents, #645,576 and #649,621 (each using the same figure on the first page), we find in the first patent that Tesla designed a quarter-wave antenna (fifty miles of secondary wire for a 200-mile long wavelength). More important is the sphere on the top which is supposed to be a conductive surface on a balloon, raised high enough to be radiating in “rarified air”. Nikola Tesla’s discovery of pulsed propagation of energy does not resemble the standard transverse electromagnetic waves so familiar to electrical engineers everywhere. Many engineers and physicists have dismissed Tesla’s wireless energy transmission as unscientific, without examining the unusual characteristics and benefits of longitudinal waves – which are the z-component solutions of Maxwell’s equations. 3. The Wireless System (efficient transmission of electrical energy without wires). Tesla’s calculated power levels have been conservatively estimated and recently updated with contemporary physics calculations by Dr Elizabeth Rauscher. For example, Professor Rauscher shows that the Earth’s ionosphere and magnetosphere contain sufficient potential energy, at least three billion kilowatts (three terawatts) respectively, so that the resonant excitation of the Earth-ionoshere cavity can reasonably be expected to increase the amplitude of natural ‘Schumann’ frequencies, facilitating the capture of useful electrical power. Tesla knew that the earth could be treated as one big spherical conductor and the ionosphere as another, bigger, spherical conductor, so that together they have parallel plates and thus comprise a “spherical capacitor”. Rauscher calculates the capacitance to be about 15,000 microfarads for the complete Earth-ionosphere cavity capacitor. “All that is necessary,” says Dr James Corum, “is that Tesla’s transmitter power and carrier frequency be capable of round-the-world propagation.” In fact, Tesla (in the Los Angeles Times, December 1904) stated: “With my transmitter I actually sent electrical vibrations around the world and received them again, and I then went on to develop my machinery.” Dr Corum notes in an article on Tesla’s ELF (extremely low-frequency) oscillator that the tuned circuit of Tesla’s magnifying transmitter was the whole Earth-Ionosphere cavity. Corum explains that a mechanical analog of the lumped-circuit Tesla coil is an easier model for engineers to understand. From a mechanical engineering viewpoint, the ‘magnifying factor’ can be successfully applied to such a circuit. “The circuit is limited by only the circuit resistance. At resonance, the current through the circuit rises until the voltage across the resistance is equal to the source voltage. This circuit was a source of deep frustration to Edison because voltmeter readings taken around the loop did not obey Kirchoff’s laws!” As a result, Edison claimed such a circuit was only good for electrocution chairs. Tesla’s World System activates the Earth’s renewable electrical storage battery, which normally sits dormant except during lightning strikes. Regarding simply the electrostatic storage capacity of the ionosphere, Dr Oleg Jefimenko, author of Electrostatic Motors, explains that during one electrical storm, the atmospheric electric field dissipates at least 0.2 terawatts (billion kilowatts), indicating that the entire Earth must have even more total available energy. Furthermore, the power loss experienced by Tesla’s pulsed electrostatic discharge mode of propagation was less than five percent over 25,000 miles. Dr Van Voorhies states that “path losses are 0.25 dB/Mm at 10 Hz” – which is so minimal it is difficult to believe for engineers who are used to transverse waves, a resistive medium and line-of-sight propagation modes that can dissipate 10 dB/km at 5 MHz. In view of our present fossil fuel-caused [or increased] global warming, Tesla seems very prophetic from his vantage point of a century ago. Tesla stated: “As to the transmission of power through space, that is a project which I considered absolutely certain of success long since. Years ago I was in the position to transmit wireless power to any distance without limit other than that imposed by the physical dimensions of the globe. In my system it makes no difference what the distance is. The efficiency of the system can be as high as 96 or 97 per cent, and there are practically no losses except such as are inevitable in the running of the machinery. These amazing facts are explained by Corum, Spainol and Corum: “…the distinction between Tesla’s system and ‘Hertzian’ waves is to be clearly understood. Tesla, and others to this day, used the term ‘Hertzian waves’ to describe what we call today energy transfer by wireless transverse electromagnetic (TEM) radiation… no-one wants to stand in front of a high-power radar antenna. For these, E and H are in phase, the power flow is a ‘real’ quantity (as opposed to reactive power), and the surface integral of E x H (Poynting vector) is nonzero. The case is not so simple in an unloaded power system, an RF transformer with a tuned secondary; or with a cavity resonator. Note that for a spherical electrostatic pulse discharge, E is radial and H is helical since J is radial (longitudinal or irrotational current). This is total anathema to transverse wave physics textbook images of E and H, which are normally perpendicular to each other. Another common criticism of the Tesla wireless power system is regarding its possible biological effects. Calculating the circulating reactive power, the Corums and Spainol find a density of a microvar per cubic metre at 7.8 Hertz, which is quite small, while it is well-known that such a frequency is very biologically compatible. The authors also look at the present 100 V/m Earth-ionosphere field and again find that raising it by a factor of 4 to 10 will pose no ill effects (thunderstorms do it all the time around the world). In terms of economic theory, many countries will benefit from this service. Only private, dispersed receiving stations will be needed. Just like television and radio, a single resonant energy receiver is required, which may eventually be built into appliances so that no power cord will be necessary! Just think; monthly electric utility bills from old-fashioned, fossil-fuelled, high-loss electrified wire-grid delivery services will be optional, much as cable TV is today. In the 21st century, “Direct TV” is the rage, which is an exact parallel of Tesla’s “Direct Electricity”. Let us fulfill this prophecy of Tesla, making it a “triumphant success” by supporting a philanthropic, international wireless power station installed on a remote island to electrify the whole world. The benefits of immediately making direct electricity available everywhere are too numerous to count.